Terry Nardone’s Tin Can Treason: Recollections from a Combat Tour of Vietnam (CreateSpace, 159 pp. $12.99, paper; $4.99, Kindle) is a tell-all memoir about life aboard a United States Navy destroyer and the dynamics of the relations between crewmen. Worried about the draft and an infantry assignment, Nardone enlisted in the Navy the day after his eighteenth birthday in 1971. Despite getting his dream sheet fulfilled, he ended up on a ship that went to war. “Are we men or boys?” Nardone asks several times while thinking through his Vietnam War experience aboard the USS Bordelon (DD881). As part of his treatment for PTSD and guided by “a diary of events,” he writes about his shipboard life in the voice of his younger self in a quest to understand the trauma he still feels nearly fifty years later. Fear and depression played significant roles in the lives of men on the Bordelon during her round trip from Charleston, South Carolina, to the South China Sea between October 1972 and April 1973. Nardone describes attempts to sabotage the ship as proof that the crew hated the war and wanted no part of it. Off the coast of Vietnam, the Bordelon primarily provided gunfire support for ground forces and took part in Operation Linebacker. Except for one engagement when he went topside, Nardone spent his combat time below deck setting fuses and moving artillery shells. His contempt for the war peaked when the Bordelon bombarded and “killed about eighteen [friendly] Marines,” he says. He felt an equally tragic loss when he saw a close friend “cut right in half by the steam” from a ruptured 600-PSI line. In combat, tasks that stressed the ship’s structure made “the old beast feel like she [was] going to disintegrate,” Nardone writes, and the crew twice retreated to Subic Bay for repairs. Nardone talks about the boredom of sailing long distances and says a few crewmen likened it to a prison sentence. He seemingly holds back nothing in describing stops that developed into orgies of drinking booze, smoking dope, and finding whores or girlfriends in port after port. A confessed self-abuser, Nardone nevertheless questioned his behavior, wondering if he “would still have nightmares and problems if [he] did not get stoned.” Frequently in trouble with the ship’s captain, Nardone once spent three days in the brig on bread and water. The book’s title is deceptive: “Treason” is not clearly defined and might be viewed from multiple perspectives. Suspected of the most flagrant crimes, the ship’s captain was relieved of his command, confined to quarters, and arrested upon returning to the United States. You could call this a coming-of-age story except that Nardone was a world-wise young man who exerted significant influence on his shipmates. He makes an airtight case for the strength of friendships and confidences that develop among workers in physically restricted surroundings, such as the hundred men on a destroyer. 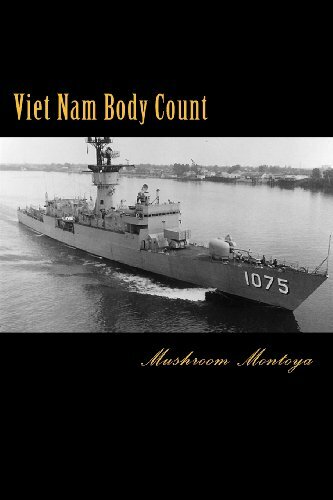 Reviewing something like a memoir a week for “Books in Review II” for the past year and a half, I have read few accounts of the Vietnam War written by sailors. Until now, the most memorable book I’ve read about the Navy was Brown Water Runs Red by Bob Andretta, which mainly covers action on South Vietnamese rivers. Tin Can Treason differs by telling more about people and the ship rather than the action. Yet Terry Nardone clearly spells out the impact that the war had on everyone and everything. He closes his book with a history of the Bordelon from its 1945 commissioning to its 1977 sinking as a target. Eight years later, U.S. Navy Lt. Bob Andretta brought much of that fiction to life for himself as an advisor to Vietnamese Coastal Group 14, stationed fifteen miles south of Danang. In six months with the Group, Andretta was struck by lightning, shredded by shrapnel, blown off a boat, and shot through both legs. After receiving his third set of wounds, he turned down a third Purple Heart and forfeited an opportunity to leave Vietnam early. His desire to help the Vietnamese outweighed all other considerations. Andretta relates his Vietnam War experiences in Brown Water Runs Red: My Year as an Advisor to the Vietnamese Navy Junk Force (CreateSpace, 428 pp., $20, paper; $8.75 Kindle). Many of the operations he writes about were new to me. As the leader of three Americans assigned to Group 14, Andretta immersed himself in the war and Vietnamese culture. He participated in practically every search and destroy mission; observed every social custom; doctored children infected with boils and other illnesses; and built a maternity ward and a two-room school for the hamlet of Doi. Along with South Vietnamese sailors, Andretta worked closely with Ruff-Puffs—Regional Forces (RF) and Provincial Forces (PF). The Navy delivered Ruff-Puffs to coastal or waterway sites where they patrolled on foot. When possible, everyone engaged the enemy with firepower from water and land. Andretta writes in a straightforward, conversational style that gives the book a humorous tone. He does not hide his feelings, and it is easy to relate to him. His knack for depicting personality traits brings characters alive. His scenes of the aftermath of battle clearly support his transition from a dedicated warrior to a man who abhors war. He learned by doing. While hospitalized at Danang with an amoebic abscess of the liver, he helped unload CH46 helicopters overflowing with Marines killed and wounded in the A Shau Valley. Even though he had already been seriously wounded, the carnage shocked him. After six months of search and destroy missions, he understood that his men “were just the bait. The artillery and aircraft had done the rest.” Only the body count mattered to his superiors, he decided. Andretta He accepted a transfer from Group 14 to ragtag Group 13, north of Danang. Group 13 saw little action. Nevertheless, Andretta worked hard to improve a dismal area. From that point, the book resembles an interesting travelogue more than a combat saga. Then he accompanied a SEAL team on a “special patrol” that ended in a shootout. “There was no time to be frightened; only to shoot well,” he said. Outnumbered, the SEALs fled: “That was probably the fastest I have ever run,” Andretta noted. After he completed his tour, Andretta flew to San Francisco, and encountered a “not very pleasant homecoming, and that’s an understatement” from war protesters. By remembering his Naval Academy classmates killed in action, Andretta repeatedly conveys the remorse felt by survivors for friends who died in the war. He recognizes that many survivors never achieve release from their sorrow. Andretta enhances his narrative by blending an excellent collection of photographs with the text, rather than lumping them together in the middle of the book. After retiring from the Navy in 1972 due to combat-related disabilities, Andretta became a lawyer and then a judge. He stepped down from the bench in 2007. His wounds still cause him problems that require surgery. In his book Norton relates his experiences in Viet Nam, using that spelling to hearken back to the days before American intervention. He includes insightful contributions from two life-long friends, Bill Sanderson and Richard Madison. The three served at Da Nang at the same time, from August 1969 to July 1970, working in different fields. Cheryl Norton also gets space to express her feelings about the year-long separation from husband Ray, during which she gave birth their daughter, Rebecca. Ray Norton spent only fourteen months on active duty in the Navy after joining the Reserves, opting to do so rather than being drafted into the Army. His basic training lasted two weeks; his account of it is a masterpiece of dry humor. Norton’s sense of humor unexpectedly pops up in other places in the book, too. During the first half of his in-country tour, Norton made the best of a boring and life- consuming job as a Tien Sha Peninsula Security Division guard. He finished his tour with detective work as one of six NSA investigators at Camp Tien Sha, adjacent to Da Nang. He reviews a dozen of his most interesting investigations, which provide excellent reading. At Monkey Mountain. The author is on the left. The book contains sixty-seven photographs, including two of Military Payment Certificates and one of C-rations, featuring an open can, a plastic spoon, and a P-38. Norton occasionally explains what is common knowledge for old timers, but does not overdo it. Jim Lamb served in Vietnam in the Navy, stationed in Da Nang. 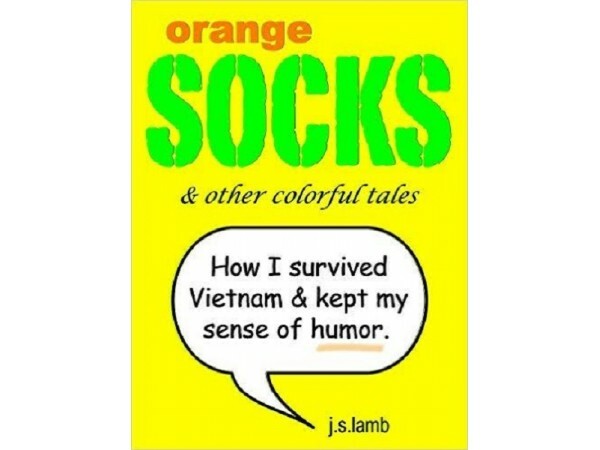 He arrived in-country in the Spring of 1970, “after the Tet Offensive, but well before the Fall of Saigon,” as Lamb puts it in his memoir, Orange Socks and Other Colorful Tales: How I Survived in Vietnam and Kept My Sense of Humor (Amazon Digital Services, 77 pp., $4.99, Kindle). This short book contains many interesting and mild little tales of his naval service. I enjoyed them, especially because the book is well-written and well-edited. Lamb begins with a chapter called “Welcome to the War,” and then gives us a chapter about a rocket attack on Da Nang, where they were fairly common. He tells us about boot camp at Great Lakes and about his six months at Aviation Electronics School at the Memphis Naval Station. He regales us with stories of his time as a troubleshooter at Corpus Christi, and about guarding the squadron of Stoofs. I won’t explain Stoofs, as Lamb does a better job of that than I could do. 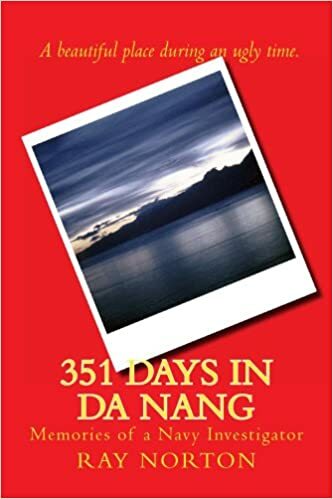 I encourage everyone curious about what it was like to be in the Navy in Da Nang during this period of the Vietnam War to read this little book. Lamb writes elegantly and modestly of his experiences and manages to make the wearing of orange socks a heroic—as well as an amusing—escapade.